The Extra Large Porcelain Bowl from Mya Saray is a gorgeous, porcelain glazed hookah bowl in the traditional Egyptian style that has been loved by many hookah enthusiasts throughout the years. This bowl is available in a wide variety of colors to suit anyones tastes and preferences. 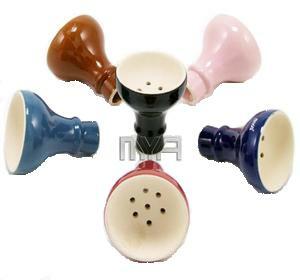 The heat retaining ability of this hookah bowl is spot on perfect and certain to give you the best session possible with your favorite hookah tobacco or herbal shisha. The Extra Large Porcelain Bowl is a larger version of our Porcelain Bowl and can hold approximately 35 grams of Flavored Tobacco.